Posted December 1, 2015 by Brassica Contributor & filed under Brassica, Detoxification, Glucoraphanin, Recipes, Tea, Uncategorized. 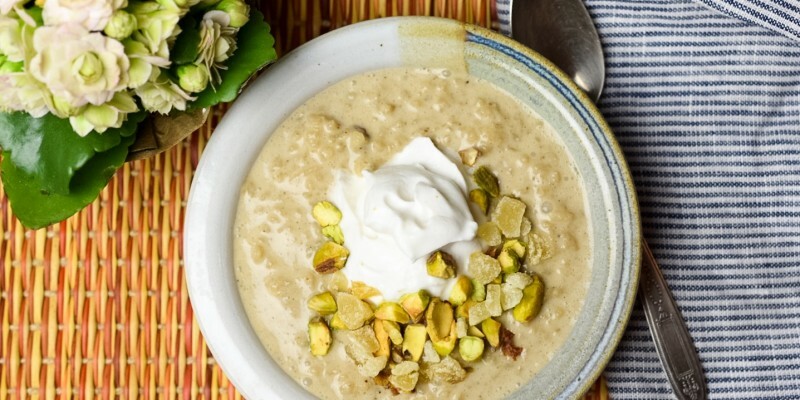 We’re sharing a delicious rice pudding recipe that incorporates our Brassica Tea with TrueBroc® glucoraphanin. 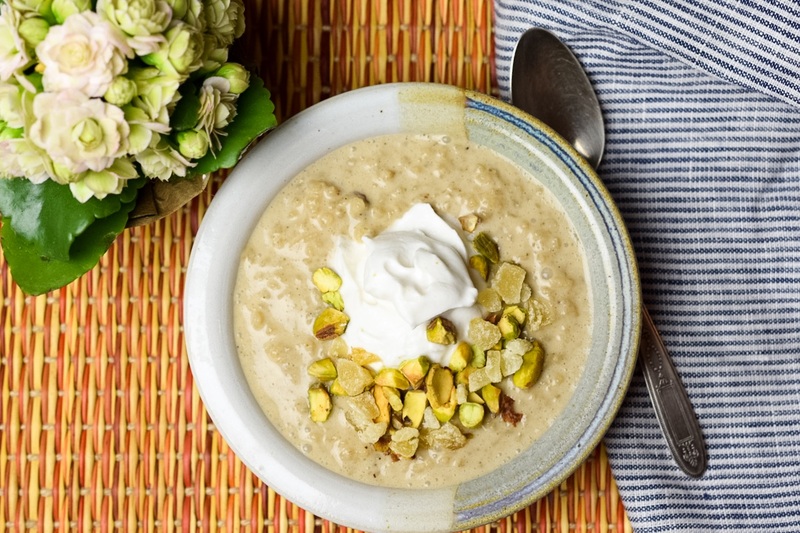 The recipe and photos were created by Amy Fischer, RD. Be sure to follow her @thegreenfisch for other recipes and inspiring photos. Brew 1 cup tea using 2 Brassica Tea bags. Combine 1 cup brewed tea, 1 cup water, 1/2 cup Arborio rice and a pinch of salt. Bring to a boil then turn down to a simmer, stirring frequently, cover and cook for ~25 min. Uncover and continue simmering and stirring frequently, stir in coconut milk and continue to simmer approximately 10min. until the rice is tender. In a separate bowl beat egg yolks with honey, coconut sugar, cinnamon & vanilla. 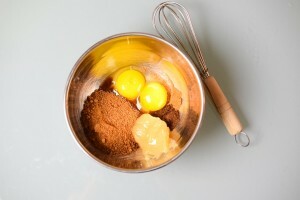 Slowly add some of the rice mixture to the egg yolks and with a whisk combine. Add mixture back into the rice and stir until combine well and egg mixed in. Remove from heat. The mixture will still be loose but will thicken as it stands and when chilled. Serve warm or chilled. Add toppings before serving. Posted November 6, 2015 by Brassica Contributor & filed under Glucoraphanin, Health, Recipes, Tea. 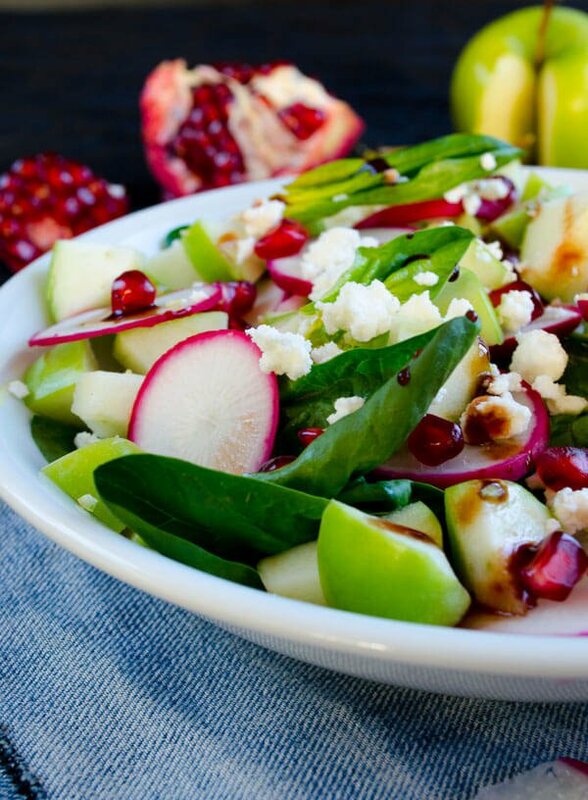 With apple season coming to a close, we’ve put together a delicious tangy spinach salad with apples, radishes and a green tea vinaigrette made from Brassica decaf green tea with TrueBroc® brand glucoraphanin. 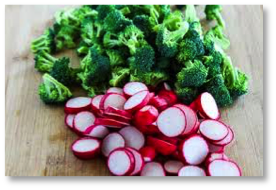 Not only do the radishes give this salad a zing, but they’re also packed with myrosinase and help to jump start the conversion of the glucoraphanin to sulforaphane. You’ll love this tasty antioxidant powerhouse. 7. Let sit for 3 to 4 hours so flavors can infuse. Toss baby spinach, diced green apples, radishes, and pomegranate seeds together. Top with with feta and Brassica green tea honey vinaigrette. Enjoy! Posted September 13, 2015 by Brassica Contributor & filed under Uncategorized. Today, Sunday, September 13 isn’t only the kick-off to football season, but it’s also National Kids Take Over the Kitchen Day. 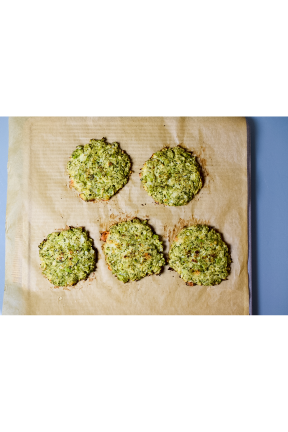 We worked with our friend Amy Fischer, RD (@thegreenfisch) to develop this easy and healthy broccoli-cauliflower gluten-free pizza crust that will wow your football guests of all ages. Add broccoli and cauliflower florets to blender or food processor and pulse until fine and resembles rice. 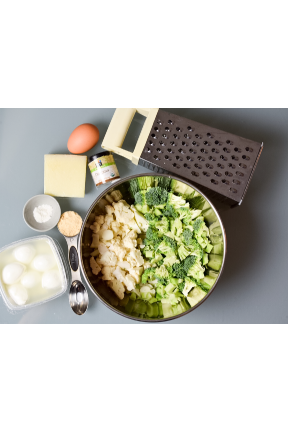 Add broccoli-cauliflower mixture to a steamer basket and lightly steam until soft, 3-5minutes. 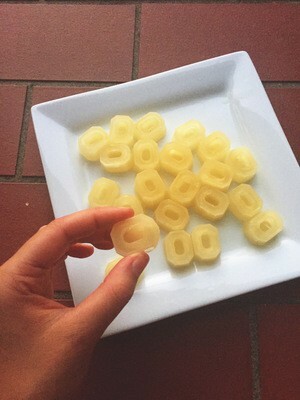 Let cool slightly and put mixture into a nut milk bag or a towel to squeeze out excess liquid. In a medium bowl, using a large spoon, combine broccoli-cauliflower mixture with oregano, garlic, pecorino-romano, mozzarella, egg, salt and pepper. Spread mixture onto lined baking sheet for one large pizza crust or divide into individual pizzettes. Bake for 20-30 minutes, until lightly browned. Posted August 13, 2015 by Brassica Contributor & filed under Brassica, Broccoli, Glucoraphanin, Recipes, Tea. Our friend at YES! 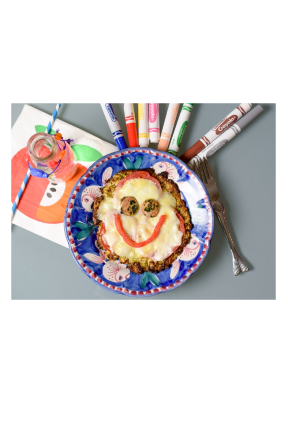 Nutrition – registered dietitian Tori Holthaus – shares 4 after school snacks that offer nutrition in bite-sized portions. She incorporates Brassica Decaf Green Tea – which is fortified with TrueBroc® from broccoli – in her “mini decaf green tea lemonade ice bites,” so when your little scholar doesn’t want to eat his or her broccoli, you can rest assured they’re still getting the powerful antioxidant protection from TrueBroc® glucoraphanin. Posted June 23, 2015 by Brassica Contributor & filed under Broccoli, Detoxification, Featured, Glucoraphanin, Health, Myrosinase, Recipes. What do you get when you combine broccoli florets with radishes? A detoxification power couple. Broccoli contains the phytonutrient glucoraphanin and the enzyme myrosinase. When we chew raw broccoli, the myrosinase and glucoraphanin interact to create sulforaphane, which is a potent antioxidant and detoxifier. In addition to being another rich source of myrosinase, radishes are mostly composed of water. Water helps to keep the body hydrated and helps to support the efficiency of digestion, ensuring proper uptake of nutrients from the food we eat – like broccoli. Our nutrition consultant, Ashley Koff, RD, developed the following smoothie recipe, featuring the power couple “Radbroc.” Enjoy! 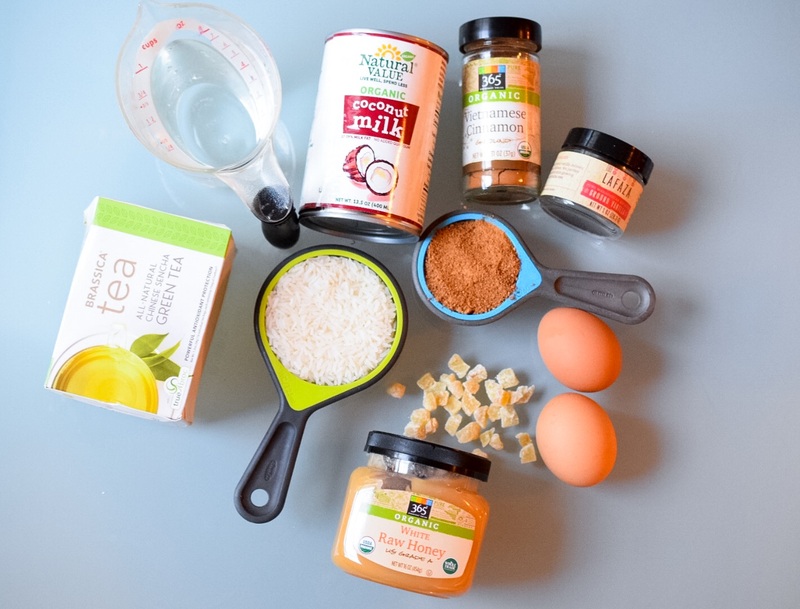 Place all items in a blender and purée. Makes 1 large (meal replacement) serving or 2 side servings. 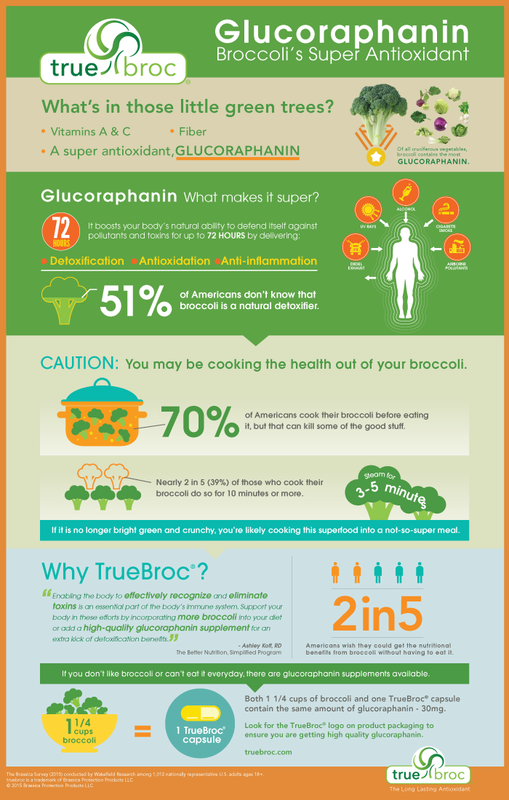 Posted May 19, 2015 by Brassica Contributor & filed under Broccoli, Featured, Glucoraphanin, Health. Posted April 21, 2015 by Brassica Contributor & filed under Brassica, Featured, Glucoraphanin, Health. Approximately 75 million Americans live in areas with unhealthy air, according to the U.S. Environmental Protection Agency (EPA). On top of this, consuming alcohol and exposure to UV rays and cigarette smoke increase the level of toxins found in the body. A natural way to help the body eliminate these harmful toxins is to increase consumption of broccoli. Considered by many as a superfood, broccoli boasts the highest level of glucoraphanin – a long-lasting antioxidant – of all cruciferous vegetables. Glucoraphanin supports the body’s own natural detoxification system. With National Air Quality Awareness Week April 27 – May 1, now is the time to identify ways to help rid the body of harmful environmental toxins. Broccoli, if prepared properly, is a natural way to help boost the body’s own natural detoxification system. Findings from the recent Brassica survey, which polled 1,012 nationally representative U.S. adults ages 18 and older, revealed that Americans are cooking the health out of their broccoli, not realizing that cooking broccoli at high temperatures and for long periods of time decrease the effectiveness of many nutrients. Americans know broccoli is healthy, that’s why nearly 2 in 5 wish they could get the nutritional benefits from broccoli without actually having to eat it. And more than half – 56 percent – of those under the age of 35 wish this. Many are confused about the health benefits of broccoli. In fact, 51 percent do not realize broccoli is a natural detoxifier. Nearly 20 percent of Americans believe kale contains more antioxidant phytonutrients than broccoli. In reality, broccoli contains the highest level of glucoraphanin of any cruciferous vegetable. 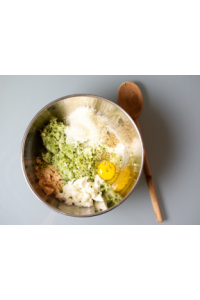 For 76 percent of Americans, cooking broccoli is their favorite way to prepare it. This includes tried-and-true cooking methods like steaming it on the stovetop (31 percent), steaming it in the microwave (18 percent) and sautéing it in a pan (11 percent). While Americans are eating broccoli, they’re cooking it at high temperatures for up to 15 minutes, which destroys nutrients in the process. The longer broccoli is cooked at high temperatures the more nutrients are deactivated, even though 13 percent of respondents believe cooking broccoli at high temperatures helps to activate its healthy enzymes. Wakefield Research conducted the Brassica survey for Brassica Protection Products, an innovator of nutritional ingredients from broccoli, in March 2015. The survey sample included 1,012 nationally representative U.S. adults ages 18 and older. Posted March 16, 2015 by Brassica Contributor & filed under Broccoli, Glucoraphanin, Health. We bet you didn’t realize that adding a houseplant in your living room not only helps to add oxygen to your home, but also helps to detoxify the air around you. 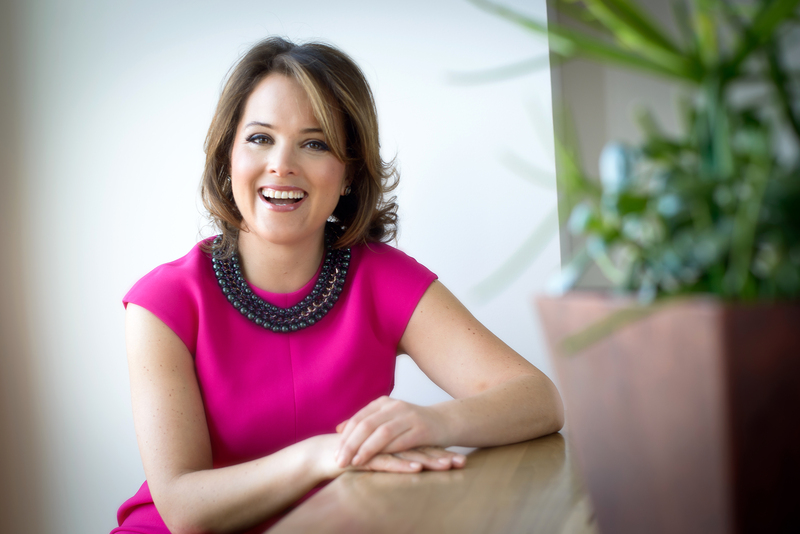 Registered dietitian Ashley Koff shares her top 5 habits to help detoxify your body in a recent blog post on WholeFoods Magazine website, and adding greens made the list. 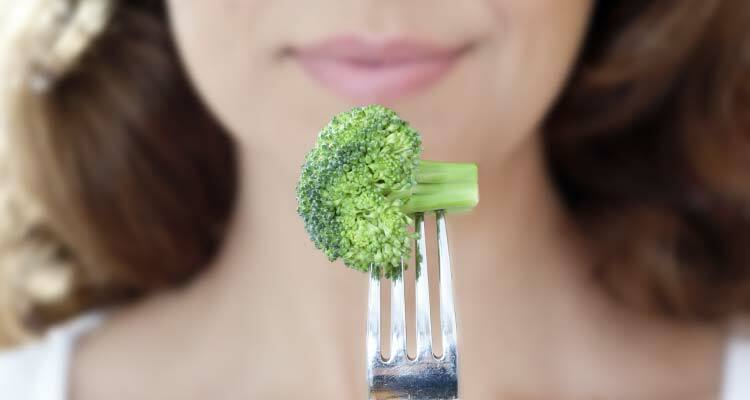 Another tip is to eat more broccoli or add a glucoraphanin supplement – such as TrueBroc® – to your daily routine. Found in broccoli, glucoraphanin is a powerful detox-promoting antioxidant that helps eliminate toxins from your body. Our bodies convert glucoraphanin to the potent antioxidant sulforaphane, which then boosts our phase 2 detox enzymes – the body’s natural defense system. The best part is that these boosted detox enzymes remain active in our body for up to 72 hours compared to direct antioxidants like vitamin C that only last up to 3 hours before needing replenished. One other tip we’d add to this list is to avoid excess exposure to environmental toxins such as those found in gardening supplies, dry-cleaning fumes, car exhaust and second hand smoke. When it comes to dry-cleaning, remove your clothes from the plastic protective bag and let them air out before storing them in your closet. Whether you’re adding a houseplant or dietary glucoraphanin supplement, be sure to avoid exposure to environment toxins whenever you can. By doing so, you’ll help to rid them from your home and your body. Looking to add a daily glucoraphanin supplement into your diet? Visit the TrueBroc® supplement page to learn more. Posted February 11, 2015 by Brassica Contributor & filed under Brassica, Broccoli, Featured, Glucoraphanin, Health, Recipes. It’s February and you know what that means. Women are wearing red in support of the American Heart Association’s Go Red for Women campaign – even Dr. Oz is supporting the cause in his red scrubs. You’ll read stories about the benefits of quitting smoking, exercising more and eating fruits and vegetables all in a concerted effort to support the health of your heart. Coinciding with these heart health messages are advertisements for chocolate candy. Sales of candy soar in February as men and women buy it as a gift to express their love and gratitude to their partner. Wouldn’t it be better to couple the bouquet of flowers with a homemade dinner overflowing with a true treat that will flood the heart with love? Broccoli helps to boost your body’s natural detoxification system, which supports overall health including cardiovascular health. So, we challenge you this Valentine’s Day – toss the chocolate and opt for a gift of broccoli to show someone you truly care. Ok, ok…if you can’t ditch the chocolate altogether, what about combining the two? 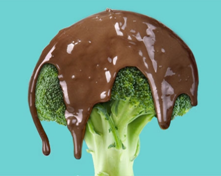 Our friends at About.com created a chocolate-covered broccoli recipe that includes broccoli, semisweet chocolate chips, peanut butter and sea salt. All you need is 20 minutes of prep. 2. Wash and dry broccoli. Trim spears to a length of about 2 inches. Set aside. Also, if desired, broccoli can be steamed to desired tenderness. However, be aware that over-steaming broccoli will breakdown the enzyme myrosinase, which helps to convert glucoraphanin to sulforaphane. Don’t worry though, your gut mircoflora will also take care of the conversion. 3. Place chocolate chips and peanut butter in a microwave-safe bowl. Heat 1 minute on 50% power. Stir and continue heating in 30-second increments at 50% power, until chips are completely melted. 4. Working quickly, dip each broccoli spear into chocolate mixture, allowing excess to drip off. Place on prepared cookie sheet. 5. Sprinkle with sea salt. Let cool 20 to 30 minutes. Refrigerate if desired. We’d love to hear from you. Share your favorite broccoli recipes with us! Posted December 4, 2014 by Brassica Contributor & filed under Broccoli, Glucoraphanin, Recipes. It can be hard for broccoli to compete with all the holiday treats that surround your family this time of year. But broccoli contains a superhero – the phytonutrient glucoraphanin – that will help keep us all healthier during the holiday season and all winter long. Thankfully there’s Xymogen BrainSustain with glucoraphanin (look for the ‘TrueBroc®‘ logo to know it’s in there) that can help upgrade any smoothie – like this Holiday’s Lil’ Healthful Helper – to help you keep the family healthy during the holidays and beyond. 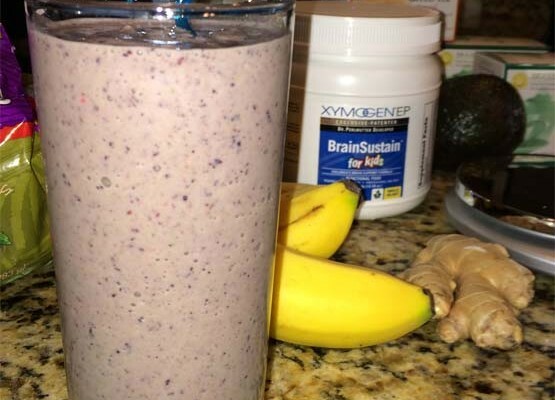 Mix 1 scoop of Xymogen BrainSustain for Kids with 1 cup low fat milk, stir until powder is mixed completely with the milk and pour into a blender. 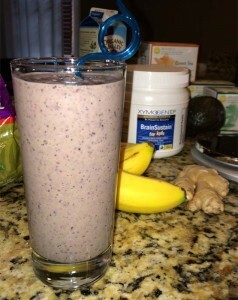 Add spinach, strawberries, blueberries and banana. Blend to desired consistency. Makes 2 servings. Also, make sure to like us on Facebook and follow @SGS_Tea to receive discounts on Brassica Tea and stay updated on all the great science surrounding our favorite vegetable.